With its wild floral elaborations and flamboyant abandonment of symmetry or straight lines, this candlestick is characteristic of the rococo style that became the rage in Paris in the 1720s. That it was made in Dublin tells us something both about the extravagant taste of the Irish ruling class and about the city itself. Members of the ascendancy could spend enormous sums on silver plate. A dinner service commissioned by the earl of Kildare in 1745, the year when our candlestick was probably made, cost £4,044 at a time when £44 would have been a comfortable annual middle-class income. The ‘family silver’ was a crucial token of status, and the over-the-top rococo style was perfect for the flaunting of wealth. 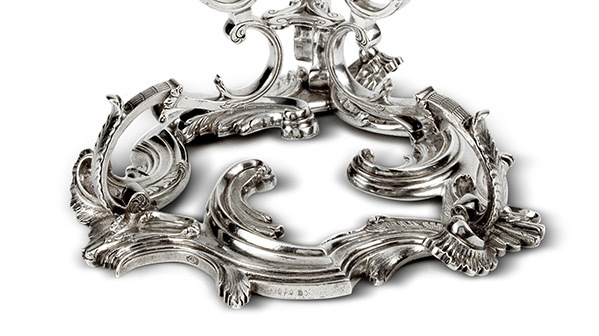 Much of the silver made in Dublin was a local version of a London take on a Parisian original—Huguenot craftsmen fleeing the persecution of Protestants in France forming one of the networks through which styles were diffused. Dublin silverware, made by masters such as John Hamilton and Robert Calderwood, was not, however, merely provincial: it attained very high levels of artistry and came to be prized for itself. 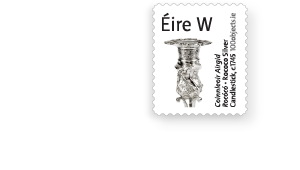 That Dublin could produce such objects is a token of its remarkable development. At the end of the Cromwellian wars, the city was small and miserable: Cromwell described its castle as ‘the worst in Christendom’, and its two cathedrals were virtually falling down. Its population was just 9,000. Yet, over the following century, Dublin came to be regarded as the second city of the British Empire. The Protestant ruling class felt secure enough to invest in the radical redevelopment of its capital city. Beginning with Parliament House, on College Green, in 1728, a series of grand buildings was erected, including the Royal Exchange and James Gandon’s Custom House and Four Courts. The mediaeval streetscape was transformed with the creation of fine squares and wide thoroughfares. Intellectual life blossomed, with figures such as Jonathan Swift, George Berkeley, Richard Steele, the Sheridan family and Mary Delany giving the city an international cultural status. The first performance of George Frideric Handel’s ‘Messiah’ at Fishamble Street Theatre in 1742 was a mark of Dublin’s new stature. For the rich, Lord Cloncurry’s claim that Dublin was ‘one of the most agreeable places of residence in Europe’ had substance. The contrast with the squalor of the city’s poor was, however, stark. With little or no sanitation, gross overcrowding, intermittent famine and epidemic disease, low wages and high unemployment, it is unsurprising that Dublin was infamous for its beggars. Child poverty and child mortality reached appalling levels: 25,000 children were taken in by Dublin Foundling Hospital between 1784 and 1796; more than 17,000 subsequently died. Dublin, for all, its elegance, mirrored the profound divisions between the ruling elite and the impoverished majority that were a feature of the ancient regime world.